The Journey of the Fool is from where you are to where you want to be. So knowing where you are and knowing where you want to be is helpful. But knowing where you really are is sometimes more difficult than we think. And that’s where Neptune can help. Right now, and for the next – what – 14 years – Neptune is traveling through his home, the great seas of Pisces. That means he’s more powerful, more active, better & stronger than before. But what does that mean in practical terms? Can we experience Neptune’s otherworldliness in a constructive way? I believe we can and I’m here to tell you about something that has just pierced the surface of the sea of my subconsciousness. 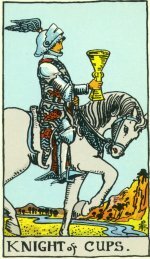 When I was in my twenties, the Knight of Cups was always my card. He is the romantic dreamer. He is the air of water: the idea of love. He thinks about it, sings about it, paints about it, and writes about it. He is an idealist. He is also a little out of touch. That’s because he’s a dreamer. 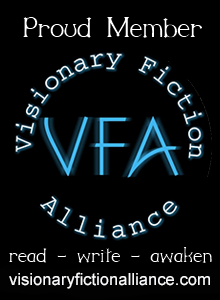 Dreams, as in those ideal situations we fantasize about, are meant to be out of this world. They are what we strive for, what propels us forward. They are what we normally think of as perfection, rather than the perfection that is that we miss every day. I am no longer the Knight of Cups. When that card comes up, I never assume it’s referring to me. Ten years ago, my greatest desire was a romantic relationship and now I hardly think about it. Well, these years, Neptune is traveling through my 7th house – the house of relationship. And ever since he entered his home of Pisces, my dreams have been more vivid, more detailed, and more intense. And these past few weeks, I’ve been having a number of them that keep repeating. One of them has me on the same hill in San Francisco every time. A dear friend of mine lives there – in my dream. It’s not a real place, but looks very much like it. Every night I’m there and every night I’m stressed about it. I don’t want to be there; I don’t want to live there; but I can’t seem to avoid it. Each time, it is something different. Last night, I felt claustrophobic. On this hill in my dream, it is crowded. The houses are all close together and the streets are narrow, just like the real San Francisco. And on this hill, there is only one way in and one way out (my friend lives on a street just like that) and I’m afraid of getting stuck. In another variation of the dream, there is this guy – sort of like a police officer. He’s there – on that hill – to make sure that everyone is following the rules. And I don’t like rules. Rules stifle creativity. They may protect, but they restrict, and they are fear based. And one person’s rules never quite fit another person. So this morning, after I woke and the dream stayed close, I thought about what this hill must mean to me. Clearly, if I keep going there, there’s got to be a message. And since the same friend is always there, and the imagery matches aspects of her life, there must be some clues there. Maybe Pluto and Neptune are working together on me. Pluto is trying to show me something deep inside of me and Neptune is using my dreams to illustrate it. And then I thought about the previous day’s reading. It showed the 2 of Cups as the present situation and the 2 of Swords underlying it. 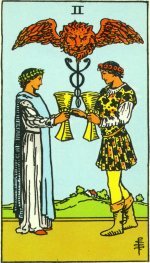 The 2 of Cups is about partnership – heart felt – loving – often romantic. The 2 of Swords shows a bit of tension. It is the pause before making a decision and/or going forward. It shows us what we are afraid of that is making us hesitant. And with a crack of lightning, it all made sense. That hill, in my dream, represents relationship and why I stopped wanting it. I’ve lost sight of the view from that hill, and see only the struggle. It looks tiresome to climb. I see lots of rules and people (society) watching over me to make sure I’m following them. I see only one way in and one way out and they are both steep and narrow. So Neptune and Pluto are at play. They got through to me. This mental construct is why I stopped wanting and stopped looking for relationship. I lost sight of the joy and pleasure, but kept memory of pain and struggle. And my reading yesterday said that too! 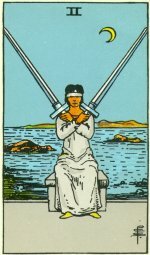 It showed the 3 of Swords in the strength position and 3 of Cups in the challenge position. 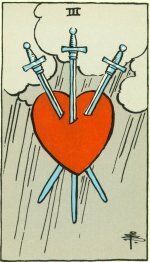 The 3 of Swords is about emotional pain. My memory of it is clear. 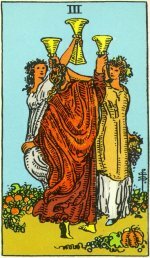 The 3 of Cups is about celebration, and my memory of that is poor. So some time in the past, I stopped being the Romantic Dreamer and became the Prosaic Dreamer. It’s now time to expand my perspective. I need to see the bigger picture. When I get to that hill, I need to look out from it. I need to notice how lovely the view is. From that hill, I’m sure one can see all the way to the ocean. The sunrises and the sunsets are probably amazing. And I’m sure there are hidden ways in and pleasant ways out – should they be needed. Maybe my dream home is on that hill and I’ve just been too resistant to look for it. Unfortunately, I picked up the cards yesterday and now can’t remember what the sixth or seventh cards were. Maybe it’s not so important to see what’s just ahead. Maybe it was only important for me to see where I am.